ButtKicking has a purpose and it works! I made a big deal about Steve and I both turning 60 last year – and we’ve had a ball for a full 12 months! One thing about passing this milestone has been acknowledging that I’ve got to ‘that age’ when I’ve accepted who and what I am. And, most particularly, how I ‘do’ me. Anyone who knows me would say: I’m more than happy to express an opinion; I’m passionate about a lot of stuff; I’m impatient; I’m prone to elbowing people aside and getting on with things I think I can do better; I probably swear more than I should; and I have a very big laugh. Among the other things they might say, I’m sure! Professionally this has all added up to my soubriquet ‘The ButtKicker’. Because I do. Kick butts that is. And I do it for a purpose – not just to feed my ego. Because left to ourselves, it’s all too easy to avoid the tough questions about your business and your plans (or lack of) for its future. And it often takes someone who’s not attached to the outcome to ask – someone who will keep prodding until you discover what’s at the heart of it all. Enter The ButtKicker! A lovely lady called Tanya booked in for a ButtKicker conversation with me. I decided from her sparse pre-call info that I needed to deliver a wake-up call. My signature ‘it’s time to get serious if you really want this to be a business’ approach. “I knew Vanessa was the ‘ButtKicker’ before I met her but that didn’t put me off. She didn’t pull any punches in the session and my business plan was soon covered in red crosses! But she went through my history, what got me to this point in my life and what I wanted to get out of my business. Well … it was like a light-bulb went off! Vanessa quickly identified where I was stuck and together we worked through some options for me to think about. Almost immediately, and because it’s now much clearer what we do for our clients, we’ve been getting lots of interest and I’m starting to become busy. I’m also in the process of going through a marketing overhaul to align our name with what we do. ALL that from one 40 minute session!! In truth, I simply asked some tough questions and reflected back the current reality. Tanya did the hard work and I’m so delighted it has worked out well. 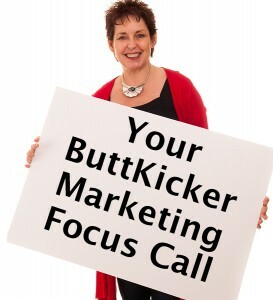 I’m always happy to have a ButtKicker Marketing Focus Call with business owners. It’s a great starting point and we can usually get to the nub of the issue with a few of those tough questions. So, if you are in the mood for a ‘wake up call’ with The ButtKicker, why not book in for your own free session. Click the link below and you’ll be able to book a time straight away. I’m polishing that boot in readiness … !